The Federal Transit Administration’s Ray Telles speaks at today’s media event. 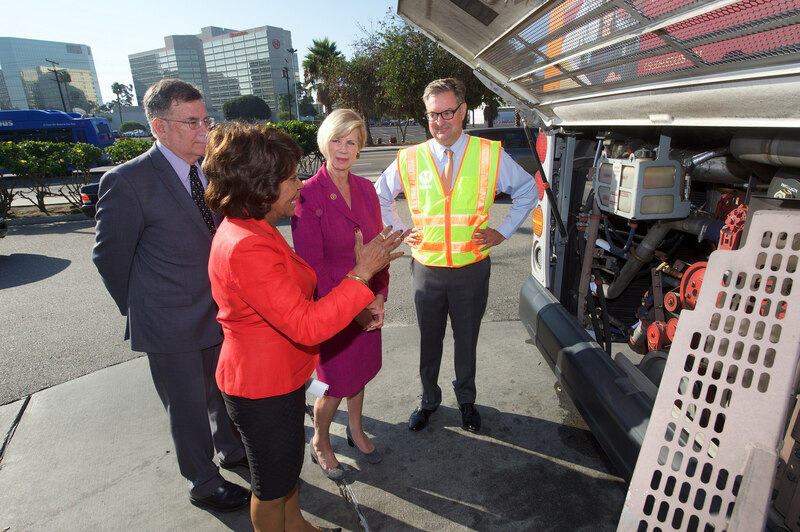 From left, Metro Board Chair John Fasana, Rep. Maxine Waters and Rep. Janice Hahn along with a Metro employee. From left, Rep. Janice Hahn, Metro Deputy CEO Stephanie Wiggins, Rep. Maxine Waters and Metro Board Chair John Fasana. A new $10.5-million U.S. Department of Transportation grant will fund the purchase of 30 next-generation, near zero-emission compressed natural gas buses to run in the South Bay and Gateway Cities region, Metro announced today. •Combined with Metro’s $10.5-million match, a total of $21 million will be invested to replace aging diesel buses that now operate on seven Metro contracted bus lines: the 125, 128, 130, 205, 232, 607 and 626. Grant funding will also pay for refueling facilities, as well as an innovative workplace development program to give workers new training opportunities to operate and maintain these and other buses around the county. •The seven bus lines that will operate these new 40-foot CNG buses together carry 6.8 million passenger boardings per year. •Metro is now in the CNG bus procurement process and anticipates putting the new vehicles into service next year. 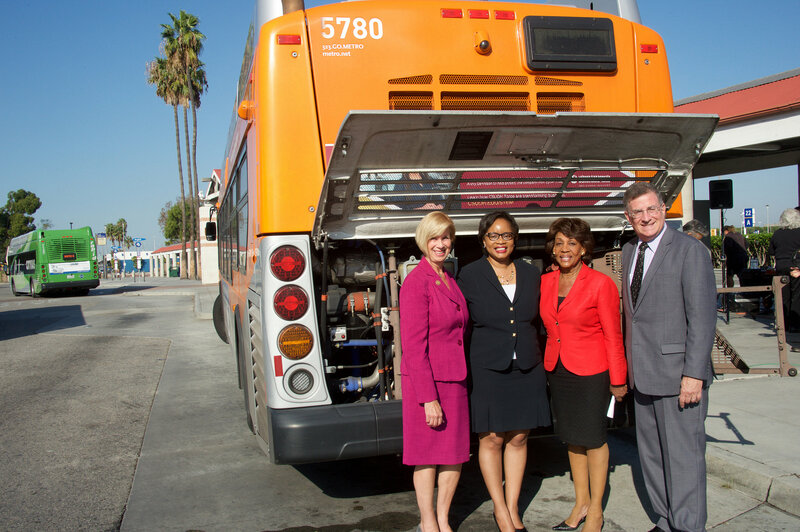 •As part of its procurement, Metro will purchase the cleanest compressed natural gas (CNG) buses ever made. New CNG engines that will be placed in the new buses are 1,000 times cleaner than the diesel buses Metro operated during the 1980s and ‘90s. 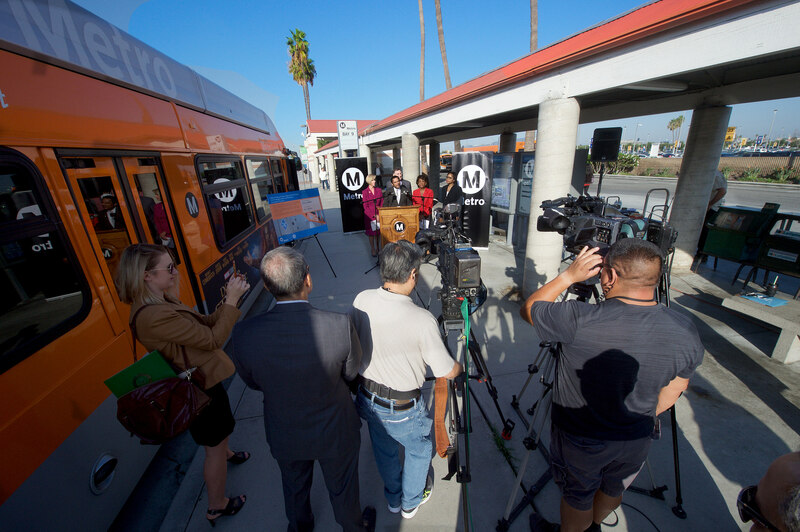 The engines are also projected to reduce emissions 25 percent more than Metro’s current CNG transit vehicles and help improve the air in the South Bay and Gateway Cities. •There are now only about 66 contracted diesel buses that have reached the end of their useful life remaining in the county. Metro has committed to replacing all of them in the coming years. •Metro currently has the largest CNG bus fleet in the country. In 1992, Metro’s Board of Directors adopted a policy to only purchase CNG buses. The agency now has 2,500 CNG buses that travel more than 85 million miles per year. In total, CNG buses have operated about 1.5 billion miles in the county since the program’s inception. CNG fuel is less expensive than diesel on a cost-per-mile basis. Over the last 15 years, Metro has saved an average of 47 cents per mile on CNG fuel costs. Here’s the full news release with quotes from elected officials. 625, not 626. Which, by the way, has had CNG buses on it since 2011, along with the 607. As a #125 bus rider, this revelation does NOT make me feel better. The last of the diesel buses run here, oh joy. More evidence that Metro and our elected reps continue to give us ‘the bottom of the barrel’ in public transit options. Jeff, Gillig tends not to bid on contracts for large transit agencies. Are you sure they submitted a bid to Metro?